The number of Connecticut drivers with illegal license plates from Maine is more widespread than the NBC Connecticut Troubleshooters initially believed. Chief Investigative Reporter Len Besthoff found that drivers in towns and cities throughout Connecticut are using Maine plates. But in one part of the state, police and the courts are really clamping down. Almost half a dozen people appeared in Manchester Superior Court on a Monday last month for illegal use of license plates. Every single one was caught with a plate from Maine, even though they live in Connecticut. "I'm not paying no thousand-dollar fine," said one driver in court. It can cost that much if you are caught. 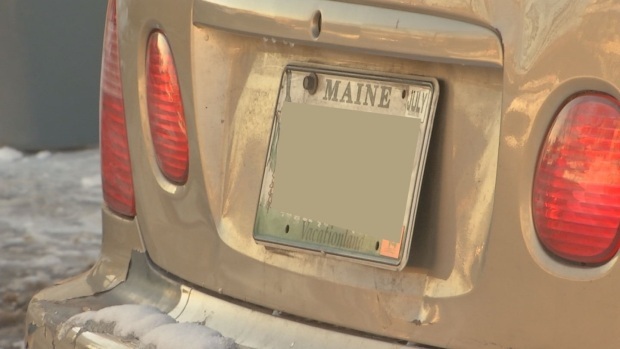 The NBC Connecticut Troubleshooters revealed the Maine license plate trend earlier this year. The police crackdown has made its way to the courts, according to Supervisory Asst. State’s Attorney Adam Scott. "Right after the new year, it seemed to pop up," he said. Maine permits out-of-state residents to register vehicles there through third-party companies online and through the mail. The Connecticut Department of Motor Vehicles says that while Maine may allow it, it's still illegal in Connecticut to garage a car here with out-of-state plates. The Troubleshooters found a number of drivers in Connecticut with Maine plates. There's nothing illegal about that, necessarily. Besthoff: Hey, are you from Maine? Driver 1: No, I'm not. Besthoff: Your car says you're from Maine. Besthoff: Where did you rent it from? Driver 1: Ummmm, the rental place around there. Besthoff: What's the deal with the Maine plates? Driver 3: No, no, no. I just came back from Maine. I just came back from Maine. Besthoff: Where? What part of Maine? Permanent Connecticut residents learn that having Maine plates is illegal when they get to court. It's also when they reveal why many do this in the first place: to avoid what can often be high property taxes when they register a vehicle here. Judge: Got your vehicle registered? Driver 4: Not at the moment. I’m getting money together. Driver 5: I mean, I think the amount I owe is about $1,500 in taxes. "I think it's a simple cost issue, whether it be paying those back taxes, or the fact that it costs," explained Asst. Supervisory State's Attorney Adam Scott. "It costs a little bit of money to get yourself registered properly." In fact, data from the Maine Bureau of Motor Vehicles shows that a significant portion of the 2,400 vehicles registered in Maine through more than 900 online companies are tied to Connecticut mailing addresses, including almost 200 in Hartford alone. While Hartford is not tracking this behavior, other cities are, including Waterbury. "In some cases, could take a year or two... to bear any fruit, for the city of Waterbury," said Joe Geary, the chief of staff for Waterbury Mayor Neil O'Leary, adding that the initiative is "absolutely worth it." For almost a decade, Waterbury has paid a company called Municipal Tax Services to cruise the city with license plate readers. MTS identifies vehicles garaged in a community that are not registered and not being taxed. Many Connecticut drivers are registering their cars in Maine, where taxes are cheaper. In Waterbury's last contract with MTS, the city recovered half a million dollars in revenues, putting lots of vehicles back on the tax rolls. MTS owner Carl DelProfio: So once they're on there, they're retaining 90 percent of those vehicles. Besthoff: So this means a lot of money, to the city? DelProfio: Yeah, not only now but in the future. For other communities, it's just a matter of relying on the courts to enforce the law and get people to register and pay their property taxes. "We really just don't want them to come back," Scott said. And that's what takes place most of the time. People pay their back taxes, get Connecticut plates and their cases are nolled. The Judicial Branch says that has already happened with three of the five people we saw in court.